There are more than a few variations that you can consider when you’re in the market for a good tonneau cover. For example, you could go with a soft roll-up cover, which is often considered one of the best inexpensive tonneau cover types, or you could go with another type that has a harder structure like a tri-fold. 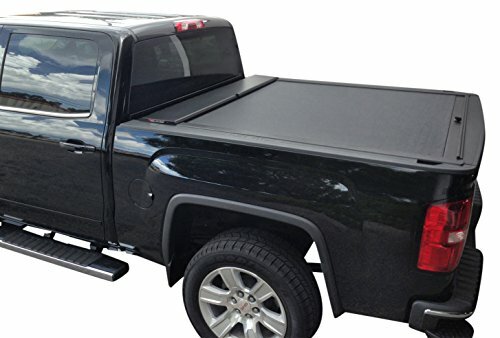 A good tonneau cover almost always is a good investment because, at the very least, every model obscures your bed’s content so that you can feel more secure. Having said that, what if you want a little more security and convenience? 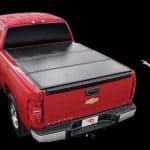 Well, for those looking for a durable tonneau that’s almost vault-like, you can’t go wrong with a retractable tonneau, which is often considered to be the best truck bed cover for the money when it comes to security. In addition to this, a retractable tonneau is also very convenient, and there are even models that are completely remote-controlled. 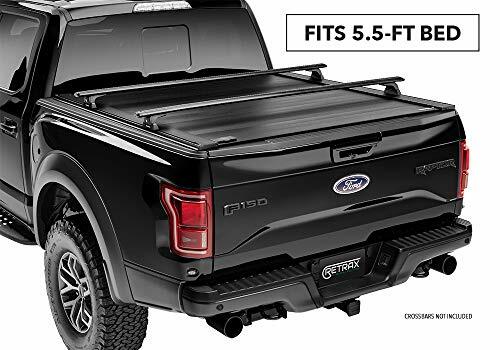 One of the more interesting aspects of this tonneau cover is the fact that it has a vinyl top, which makes it seem more in line with some of the tri-folds and soft tonneaus on the market. Even considering that, this is definitely a retractable product through and through; it has a corrugated aluminum structure underneath the tonneau that reinforces the whole product so that it’s tamper-proof. In addition to this, this is also a very waterproof product; the vinyl surface is very well sealed against moisture, and where the tonneau contacts the tailgate there is a weather strip. This weatherstrip actually reaches over the tailgate, which provides a strong barrier against water. 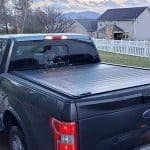 This is a bolt-on retractable tonneau, so installing it to your truck bed will provide a high level of confidence because detaching it would first require the tailgate to be open. Some other forms of tonneaus can be dislodged by fast winds, but since this product is so firmly moored to your truck, this simply will never be a problem. Installation, despite its strong attachment method, is very simple. In fact, it’s possible to install this Switchblade retractable in less than an hour, which is fairly uncommon in a tonneau of this type. Conversely, it only takes about 10 minutes to remove the tonneau when you have a large amount of cargo that simply won’t fit underneath. Retractables need to be easy to deploy so that you can have easy access without sacrificing durability, and this Switchblade tonneau fits the bill. Pace Edwards designed it with continuous spring action so that a simple pull will close and open the tonneau. Do you like to RV? If so, Pace Edwards has made this product very compatible with fifth wheel hitches. Simply retract the tonneau and install the fifth wheel assembly without any issues. Finally, unlike other retractable tonneaus, this product doesn’t require any drilling, which is an impressive feat. Keeping your bed nice and watertight is important, especially if you are filling your bed with cargo that needs to stay nice and dry. This product, which comes from Gator Auto, has a rigid aluminum top that is seamless and looks very attractive. When water or even snow accumulates on top of the tonneau, the runoff is then funneled into the canister underneath the tonneau, where it flows into a tube and out of the truck. The slats atop of the tonneau are also powder-coated so that rust and corrosion won’t diminish their effectiveness over time. To complete installation, you will need to do a bit of drilling, but the entire install process is relatively easy and shouldn’t take more than an hour to complete. Once completed, you’ll love the security that this tonneau provides; each of the components is completely tamper-proof, and since the aluminum plates are nearly flat, you’ll also love the aesthetics of the product. The retractable door on this product is one of the few retractable components on the market that doesn’t use a spring-loaded system. In fact, the tonneau uses a sealed ball bearing system that makes it very easy to deploy and retract the tonneau. To release the tonneau, there are two latch-like mechanisms on the tailgate end, and once unlatched, there are three stop points. These stop points allow you to lock the tonneau at specific areas, and the centermost stop point is adjustable to your preferences. Sometimes, retractable tonneaus have a large canister at the cab side of the truck that can be a bit unwieldy. This product, on the other hand, as a nearly flush canister that helps make your vehicle more aerodynamic. All in all, this retractable provides a very well-rounded performance for truck owners, and it’s even available in both 6.4- and 5.7-foot varieties for the Dodge Ram line of trucks from 2009 through 2018. It’s important to note that neither of these variations is compatible with the RamBox-equipped versions of the Dodge Ram. When you’re driving a Chevy Silverado or GMC Sierra, having a heavy-duty tonneau to protect your cargo can be very advantageous. This product, which is part of the Recoil series from Gator, works for the 2014 through 2018 models of both of these vehicles. It’s designed to provide a sturdy enclosure for your goods, and it also has a svelte design that most truck owners will love. In fact, the Recoil has some of the flatness and aerodynamics that you would expect in a hard tri-fold tonneau, but with this unit, you achieve even more security. What is the weight and can I lift this by myself? This tonneau is comprised of powder-coated aluminum slats that are lightweight and durable, so it will be easy to install with one person. Underneath the top, you’ll see that the tonneau has an almost corrugated design that allows it to retract and deploy while still maintaining its strength. Since it’s powder-coated, this tonneau resists all forms of moisture, and if you store it in a wet area, any accumulated water travels through channels into the canister, where it’s expelled via tubes. The finish on the slats is also UV-resistant, so you won’t have to worry about the top layer fading in the sun. Really Tonneau Covers Improve MPG, what do you think? In daily operation, the tonneau won’t open unless you first unlock the tailgate. Once unlocked, you can use the grip latch on either side of the tonneau to move it to whichever position you prefer. When in use, the tonneau locks into three positions that are closest to the tailgate, in the middle, and near the head unit. The middlemost locking area is fully adjustable so that you can tailor it to the job. To do this, you just need to move the bumper in the middle to the preferred position. Constructed of strong, aluminum slats and powder coated in a matte, textured black finish to withstand nature's toughest elements. The Gator Recoil features a custom built canister for the ultimate protection of the cover when rolled up. The Recoil has five intermittent locking positions for flexible hauling options, along with movable Latch Stops for unlimited locking positions. The "No-Profile" front canister cover helps to eliminate water and debris from running into the canister. Simply pull the quick release handle conveniently located on the driver side of the truck to open the cover. 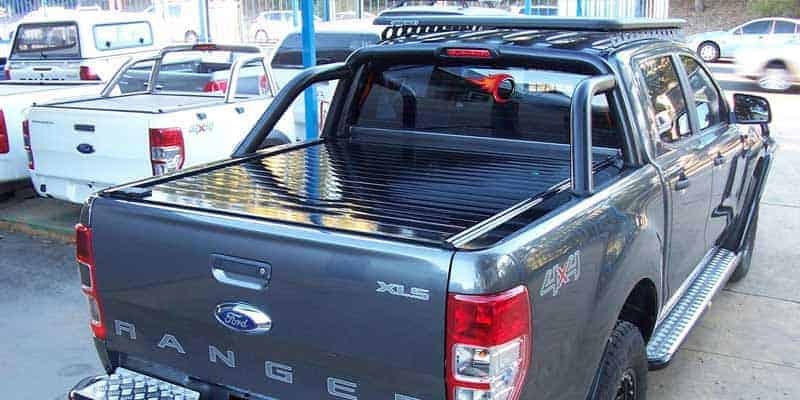 The Roll-N-Lock series of tonneau cover is widely considered the go-to retractable tonneau due to its rigidly strong body and attractive design. These tonneaus are also very secure when it comes to moisture, and this particular product, which is part number LG221M, does a great job of protecting your precious cargo. The first thing you might notice is that the top of the tonneau is vinyl. This vinyl is weather-resistant and keeps water and moisture from working its way into the bed. Underneath this vinyl, you’ll find corrugated aluminum, which is both lightweight and strong. Any water that lands on top of the tonneau is channeled through the top part of the cover and is directed into the canister underneath. From here, the water flows into a tube that directs the flow outside of the truck. The tonneau cover utilizes springs to help propel the cover forward and backward, and for the most part, this is a fairly easy process. The tonneau locks firmly into place when it meets the rearmost bracket, and the only way to get into the bed is to unlock and open the tailgate. To open the tonneau, you simply have to turn the lock lever. From there, you can use the attached strap to retract and deploy the tonneau to the desired position. When installing the product, you simply need to clamp on the tracks to the body of your truck, which means that you can install the product in less than an hour. Roll-N-Lock designed this specific product to fit the Chevy Silverado and the GMC Sierra 1500 models that have 6.5-foot beds. Specifically, this model will only work on the 2014 through the 2018 model years of these vehicles. 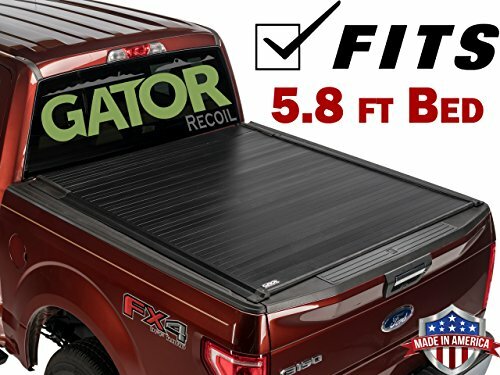 When you purchase a tonneau, it’s natural to ask, “What adjustments must be made to install this cover?” In many circumstances, those buying tonneaus assume that they won’t have room for large items like bike racks, kayaks, or any other large piece of equipment, but this product from RetraxPRO can significantly change these expectations. Not only is this a very secure retractable tonneau, but it has compatibility with a rack that you can use for any of the aforementioned items. This means that this is a good option for anyone looking to be more active, and while you carry your items, there’s still plenty of security and dryness for your in-bed items. Additionally, you can also use the Trax Rail System to provide extra carrying capacity for your truck; these rails are perfect for items like additional luggage and instruments. In fact, this tonneau is compatible with Rhino Rack, Yakima, and Thule products. When it comes to standard retractable tonneau operation, the XR retractable also has a vinyl-coated top with an aluminum base, and it also has the weatherproofing that you can use when you’re out and about. When using the tonneau, it can be locked into several positions. This will allow you to carry oversized items in the back of the bed while carrying more items on the rack system. When not using the racks, this is a very low-profile retractable tonneau. There isn’t a large head unit, so you don’t lose aerodynamics, which can improve fuel economy. The tonneau uses springs to provide an easy opening and closing experience, and it locks securely when you close the tailgate. The tonneau itself is well-protected from the elements, and any excess moisture simply drains off of your vehicle without any accumulation. Trax Rail System provides increased cargo capacity above and below the cover. Compatible with most T-Slot accessories. From Yakima, Thule and Rhino Rack and many more. Cover maintains full functionality even with cargo loaded on top, and is key lockable in any position. Low-profile patented design that streamlines the overall appearance and provides a firm seal around the perimeter. 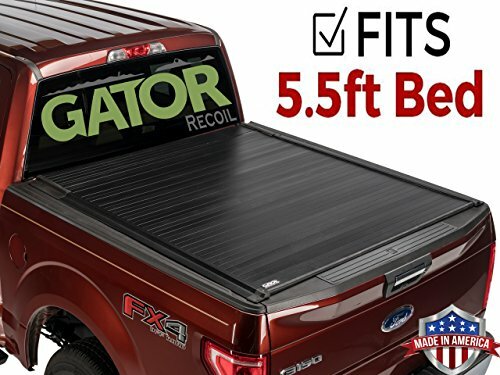 Gator’s Recoil series of retractable tonneau covers utilize aluminum slats that are weather and moisture-protected so that you won’t have to worry about the elements ruining your cargo. Not only are these slats powder-coated, but they also utilize a channel system that propels accumulated water off the top of the tonneau and into a tube that safely runs the liquid back out under the truck. Additionally, the top surface of the Recoil also is capable of handling heavy snow during snowstorms and is also tamper-proof. In fact, the tonneau is nearly impossible to open without first opening the tailgate, and once the tailgate is opened, the tonneau is very easy to manipulate. This is because the tonneau is set on sealed ball bearings that make it slide easily. You can even opt to lock the tonneau into five specific positions, which will allow you to carry oversized items. In fact, the three center most points are fully adjustable so that you can lock at your preference. The tonneau is unlockable via a quick-release lever on the driver’s side of the tailgate end of the tonneau. This tonneau is designed to have a low-profile as well. This is a result of the front canister being designed to sink underneath the body of the tonneau so that there’s no extra “hump,” which is a feature of some retractable tonneaus. The cover attaches to the rails of the truck via several clamps, and once they are attached firmly, they are impossible to tamper with. This particular model is designed to be used with the 2015 through 2019 models of the F-150 and will only fit the model with the 5.5-foot bed. This Gatortrax tonneau has a unique feature that isn’t found in many tonneau models: it can be opened even if the tailgate of your bed is shut. As a result, there’s a lot of ease of use with this product that will allow you quick access to your bed’s contents without the need for a key. This product accomplishes this via a locking lever that you simply raise up and drag. As a result of this lever, you can more easily manage the operation of the tonneau, and you’ll even be able to lock it at just about any position along the rail system. This makes this a very versatile product to purchase, especially if you’re going to be carrying large cargo items from time to time. Are you worried about security? This tonneau can be locked with a key so that unscrupulous people won’t be able to access it when you’re not around. Also, Gatortrax used polycarbonate slats in the construction of the tonneau’s sliding door. This material is super-strong and can hold up to 300 pounds. This can be very useful in snowy areas since accumulated snow can absolutely destroy a tonneau cover. This material also is weatherproof and will stand up to UV rays as well. Water is channeled through a drain tube that is designed to exit the truck via a hole that can be drilled into the bed of the Tundra. One of the best features of this Gatortrax tonneau outside of its high level of security and weatherproofing is how attractive it is. The canister has a very low profile, and Gator Covers provides two different finish variants for the 2007 through 2019 Tundra: gloss and matte. Both of these are designed specifically for the 5.5-foot bed variations of the Tundra, and having a choice in the physical design of the top of this retractable tonneau adds an extra degree of customizability. As you can see, there are some truly excellent models of retractable tonneau cover out there on the market. All are very secure, are easy to deploy and retract, and many can be considered the best waterproof truck bed cover models on the market due to excellent sealing technology. If you are in the market for one of these, take another look at our review section; it’s filled with insights that will make your search much easier.